There are no strings attached to my friend with benefits. Yesterday I came across this hilarious list of 25 questions to ask someone when you're stuck together during a hurricane. I was kind of stuck with someone this last weekend and though we are great friends, we aren't romantically interested in each other. I still sent it to him. And it reminded me of a recent list that I came up with (I'm sure based on some other list that I saw on that website). Drumroll please. Reasons to justify having a makeout buddy. 1. He has cable - you don't. 3. His couch is quite comfortable and yours feels like a metal bench with a piece of pleather over it. 4. He always seems to contact you when you are out and about - and he lives close to a subway stop. 5. I like to kiss. So shoot me. 1. He doesn't speak to you in public. 2. You like someone else. 3. Two of the reasons above no longer exist due to a recent move. In July I went to Seattle for approximately 24 hours to spend some time with close friends. When I arrived at the airport, I was glad to see that little Lucy had forded the river safely and made it to Oregon Washington. I have been worried about that ever since I quit in the middle of my Oregon trail game in the 5th grade. Kim, Steph, and Me. I love these girls so much. So here is the back story - The two on the left are cousins and their respective mom and dad grew up in the same ward as my mother. Kim's family moved to North Carolina when I was 11 and she quickly became my best friend. When Kim's cousins came to visit, her Aunt and my Mom would catch up and so the first time I met Steph I was probably 12 or 13. Fast forward through years of living in Utah and being best friends still with Kim, I would see Steph around campus at Ricks College and other various things that we were both involved in. We were bridesmaids at Kim's wedding in San Diego about 3 years ago and Steph and I were both at a loss as to why we weren't closer friends. The rest is history. Sometimes I forget that they are related - and then they act like each other and it freaks me out. I was so glad to be able to spend time with Kim - the time we get to spend is far and few between these days. Boo to that. For something to do on a rainy day in Seattle, we went to Pike's Market and ate donuts, crepes, and cherries. Oh, those cherries were amazing. Every time that Kim and I see each other, we try and get a photo - that should be a post in and of itself. Now that I have a photo scanner, maybe I should get on that, eh? Here is our 2011 pic. And anyone who can hula hoop, play the guitar, play the harmonica, sing, and dance at the same time deserves to have a photo on the blog. And I will leave you with a cute pic of Steph and Marcus. Maybe you heard about some of the action that has been going on in New York over the past week? Earthquakes, hurricanes, floods, rumors of wars, etc. I have to admit that things got a little exciting around here as far as natural disasters go. Maybe that can be another post? Maybe. Really though, the most exciting thing that happened in my life this last weekend was that I moved into my new apartment and I could not be happier about it. There are a lot of great things about it and I'm sure that those things will become apparent in subsequent posts, but here is a photo of my new bedding (and bed!) - I am in love with it. This was one of the best weekends I've had in New York - and I left the apartment once. And before anyone thinks that I am ungrateful, I owe many many people so much for letting me stay with them during the past month. I think that in the month of August I slept (alone, Mom) in 8 different beds. To anyone who housed me or fed me or friended me - you are the best. Oh, I am so happy. So happy. A friend of mine is moving away next weekend. And while I am sad to see her go, I am moving into her bedroom, I took her calling, and she is moving to San Francisco. Maybe she can move into my old bedroom and take my old calling? Would that make things even? As a going away, we had a spa day with some of her nearest and dearest in Heaven. Heaven is in Queens, believe it or not; and is a place also known as Spa Castle. 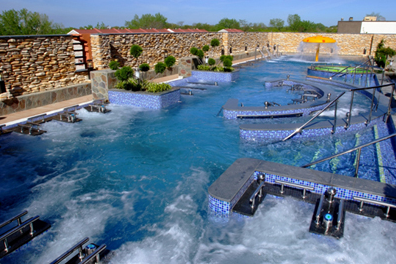 Holy cow - if being in water and laying in saunas is your thing, this is the place to go. First off, the girls all wear matching outfits and so do the boys. Then in each locker room, there are bathing areas where swim suits are not allowed. Scary. For most of the day, we laid in saunas, hot tubs, special pools where the water flowed over you, etc. Each sauna had different minerals - like jade, gold, salt, etc. and was pretty cool (and hot). I run fairly hot naturally so I didn't last as long in the saunas as some of the girls did. I really enjoyed my 45 minute nap though in a lounge chair this afternoon. Those were special times. By 6:30pm, there were only 3 of us left at the spa. We went down to the locker room and checked out the spa there and decided that we were going to brave it and go full throttle. Let me also say that the towels that they gave you in the locker room were about 6 inches wide and 12 inches long. If you were going to do it, you were going to do it. I must admit that after about 30 minutes of being in the room with about 50 other women who were baring it all, it became fairly empowering and suddenly I realized that no one cared the least about what I look like without my clothes on...except me. And then I ate a huge burrito and a snow cone for dinner. I'm just going to eat away that pain! So - would you do it? I'm curious. Are you too self conscious or would you strip down in front of your friends in a bathhouse? The other day I somehow stumbled across this song called "The Pretty Girl From Matthews". If I'd have known that you wrote a song about me, I would have loved you so much sooner. But really - I want to know who this song is about because if she is from Matthews, I know her. For reals. I have used my crazy amazing deducing skills to figure out that this "Matthews" is my hometown. I will stop rambling about this now. It is quite a country song. Which is fitting if you are singing a song about a girl from North Cackalacky. Last weekend I went camping with friends. Please reread that. I went camping. I was talked into it for a few reasons. The first being that I really liked who invited me (in a friendy girly way). The second was that I decided that in an effort to make more friends, I was going to say yes to anyone who invited me to do something unless I already had solid plans. So, I borrowed some camping gear from a generous friend (who is also hott - thanks, Jen!) and headed out into the wilderness of Scranton, Pennsylvania! No, I did not see Dwight Schrute there. 1. Pack up a rental car so full that you are fairly sure that you will be feeding 100 people and housing 50 in the woods for 2 weeks. 2. Get stuck in traffic on your way through the Lincoln Tunnel at 9pm on a Friday night. 3. Take a photo with Adrienne in a car, because you are in a car and not in a subway or on a bus. 4. Make friends with the local campers when you arrive at your campsite and have them give you enough wood to make s'mores. Put your headlamp on so that you look more outdoorsy. 5. In the morning, plug your waffle-iron in and eat up. 6. Appreciate the outdoors with 7 friends after breakfast and stay in this same position until someone realizes that it is 2pm. 8. While you are kayaking across the lake, it will start pouring rain and you will spend the balance of your time in the wilderness inside a tent napping, reading, talking to friends, OR you will be under a tarp eating dinner and you will be mostly damp. 9. I will spare you photos of this, but you will be munched on by approximately 500 bugs that I have decided were chiggers. Just imagine a foot that looks like it has chicken pox over every inch of it. There you go. Also, imagine the cute pedicure that I got today at lunch. That's even better. In regards to the other craziness in my life (aka - couch surfing), things are going well. I am really grateful for good friends. Also, my dad is going under the knife tomorrow and getting a rod put into his leg. The saga continues. "So, a lot has been going on with me. 1. My parents were in a horrible motorcycle accident in Spain and they are finally back in Utah and it will be a long road of recovery for both of them. 3. I found out that my roommate was overcharging me by $400 per month and pocketing the money. 4. I AM TURNING 30 IN 3 WEEKS." OK - maybe I cried a little earlier. Life has been hard the past few months - not going to lie. I sent out an SOS to friends last week and was sent a lifesaver within minutes from so many. People invited me to stay with them, to dinner, to classes where I could punch people in the face, to help me move. Last Saturday was easily one of the worst days that I can remember in recent history. Moving under duress is never good. BUT - I went to brunch with some friends that morning which was wonderful and needed, then that evening I went to see the Alexander McQueen exhibit at the Metropolitan Museum of Art where I stood in line for more than 3 hours and caught up with a wonderful friend (or 2). Just wanted to send out a little note to say that I am alive and doing well. I watched Bachelor Pad last night with my friends and who knew that watching Vienna and Jake (and Kasey) again would cheer me up so much? If bad things happen in three's, there are some amazing blessings waiting for me around the corner. In the midst of catching up on the blog, life has happened and tonight instead of going to play flag football with friends, I decided to lay in bed and catch up on blogs and chill out. I was out until approximately 2:30am on both Friday and Saturday night, and my lack of sleep is catching up with me in a major way. That is my excuse, ok? turned out and think to ourselves that our problems are harder to bear in some way or another. No one knows in their darkest moments how the light is ever going to come again - and I am so very grateful that I am being molded into the person that I need to become. So many people have reached out to me lately and I have felt very loved. I will eventually update you on my trip to the West Coast a few weeks ago, but for now, these girls should know how much they are loved. What a great group of friends I have. A year later and I am still calling you withmy problems. Thanks for being the light at the end of my tunnel. You know how easily scared I get.